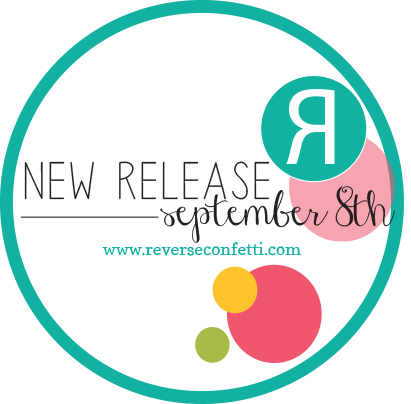 Hello Everyone...today mark the Day 1 release September previews at Reverse Confetti. Remember all products will be available for purchase on September 8th. 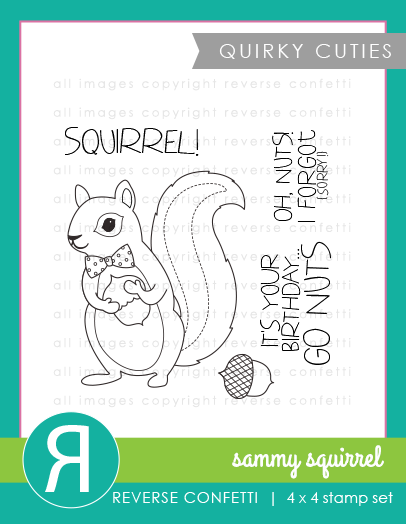 Its all about Quirky Cuties: Sammy Squirrel. This Sammy the Squirrel is so super cute! To begin my card I first cut a panel just a little smaller than my A2 card base. 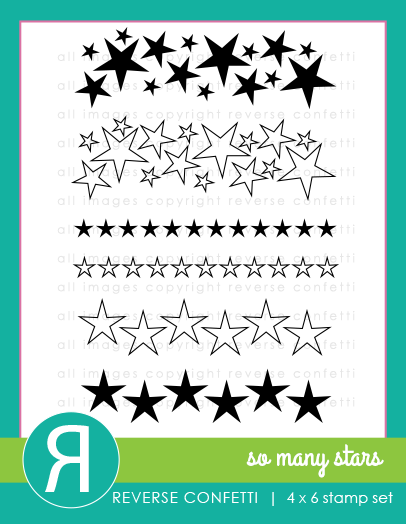 I then stamped the So Many Stars stamp set and added some Stickles on the stars for little glitters. Once the glitters were already dried I die-cut the tag from the Tag Tote Confetti Die to create a window for the Sammy to stand on and put it aside. Next I went back to the card base then distress the middle using distress ink Wild Honey. Next, I adhere some foam tape on the star panel added Sammy Squirrel on the center. 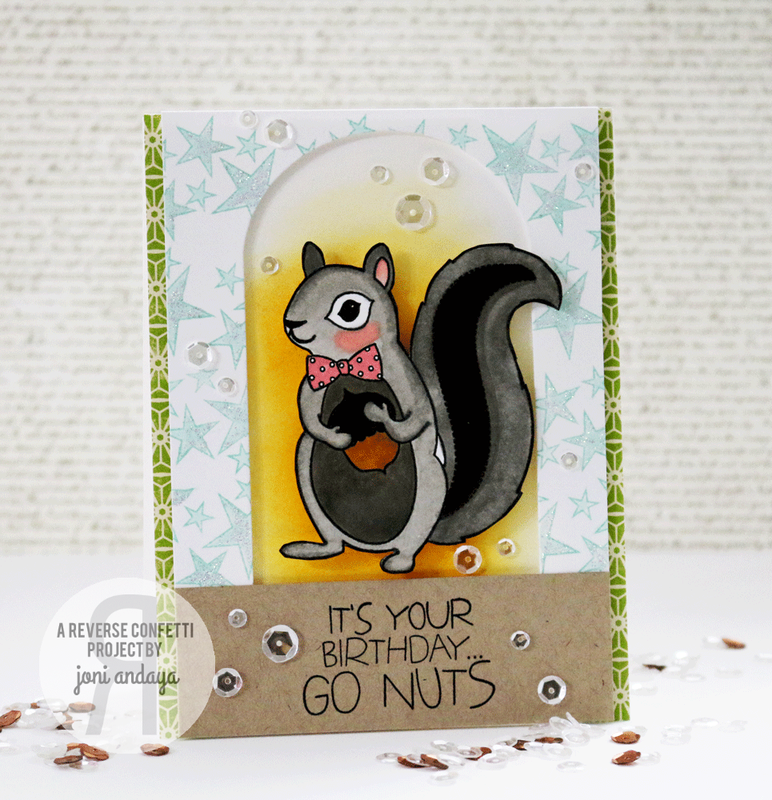 I stamped the sentiment on the kraft cardstock and adhere, the sentiment is from the same set Quirky Cuties: Sammy Squirrel. I also added some Pretty Pink Posh Sparkling Clear sequins to finish off the card. The look of the full view of the card. so many beautiful details. this is lovely. Oh this is so fun and cute. Love his little bow tie. Very cute. I like your coloring, the sparkly stars and the window you created. Love that star background and the sentiment! I love this, Joni! So sweet! Such a fun & adorable card ! Love the stars and Sammy! SUPER CUTE! Love that sentiment!!! I just love a squirrel in a bow tie!! such a cute card! 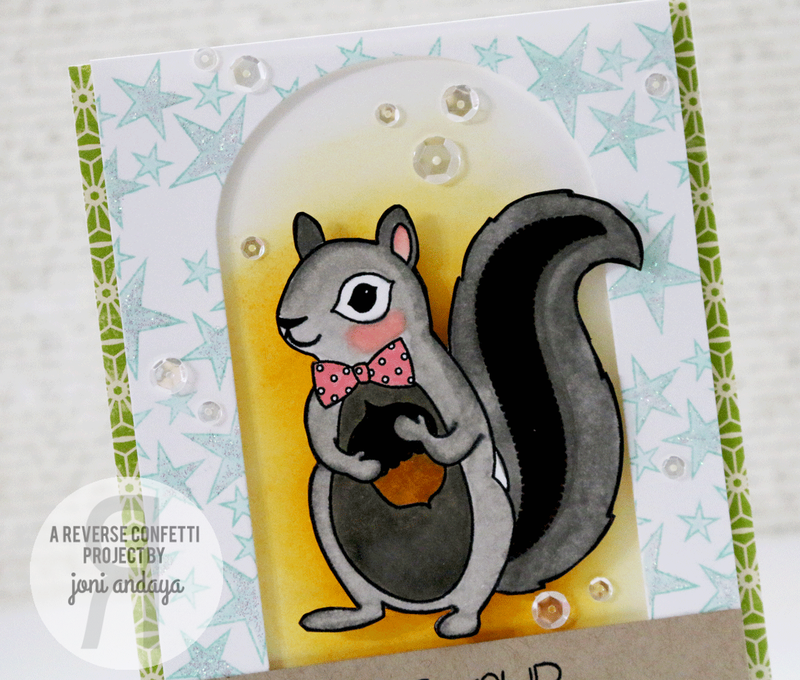 Cute card - I love Sammy's color and love that pop of pink for his bow tie! oh my word how totally cute.. So adorable, love the sparkle! Very sweet...love the stars and sequins to go along with this little guy. Loving all the Sammy cards. Very lovely. Coloration is awesome. Adorable! Love your coloring and the sparkly stars background! Isn't he a dapper little fella!! 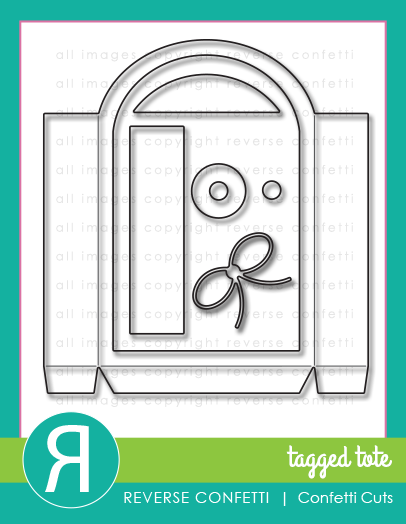 This card is beyond excellent and your coloring is so fabulous - great attention to details too!! Such a sweet card Joni. Love the darling squirrel and the coloring. The half oval window looks great. Oh, those stars are awesome. I love what you all are doing with Sammy Squirrel! Your card turned out awesome! Love Sammy with his bow tie and pink cheeks! OMG your coloring is super, Sammy is really popping. Your design is awesome!! Sammy is adorable! Love your card! Very cute love his eye and blushing face. Cute card! LOVE the pretty layers, with the twinkling stars and sparkling sequins, LOVE the golden glow around Sammy too!!! This squirrel is the sweetest and you did an awesome job on the coloring! Eeeek, Sammy is adorable and very dapper! Fabulous card, Joni! What a fun & cute card! 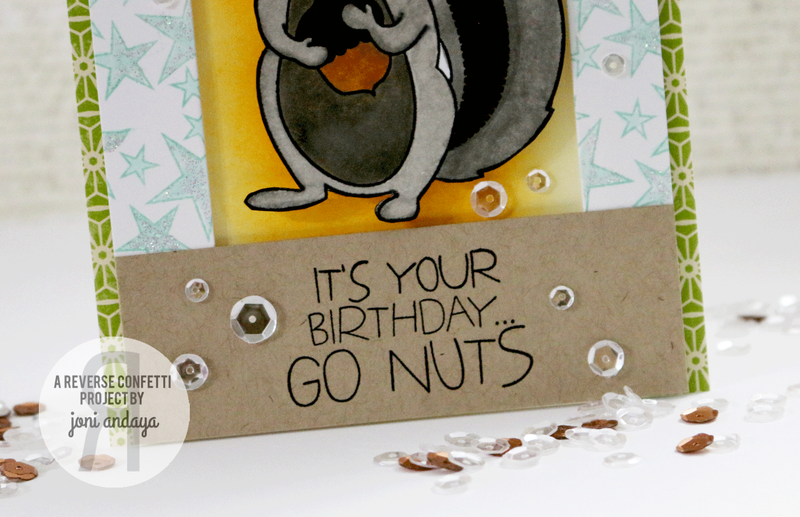 A really well-dressed and embellished Sammy on your card! Love it. What a cutie, your colouring is fabulous! Adorable card - love that squirrel with his jaunty bow tie. Love the shading on Sammy. He looks so elegant with his bow tie. Great star background and colors on your cute card! Very fun!